As 2018 ends, we’d like to take this opportunity to thank all of our friends, members, partners and supporters for your brilliant and tireless work in protecting the health of communities across the country. We’ve made good progress in the past year, but there is so much more to be done and the Network is looking forward to the work we’ll do together in the next year. Connect with us anytime. 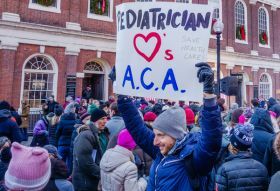 A federal district court judge in Texas recently struck down the Affordable Care Act's individual mandate as unconstitutional and found that the rest of the Act was not severable and struck it down, too. Here’s our overview of the decision and what’s to come. As recognized by Healthy People 2020, reading makes a critical contribution to health. One principal way libraries promote health is through supporting literacy in early childhood, and access to books for parents, children, young adults, adults and seniors. However, overdue fines can present barriers to accessing library resources. Communities throughout the country are increasingly implementing policy and programmatic approaches to address these fines. Registered professional school nurses are uniquely positioned at the intersection of student health and education. This survey of scope of practice laws for school nurses outlines for each state and the District of Columbia, important requirements related to training of nurses, as well as the types of health services nurses are able to provide to students. In 2018, Network webinars covered a range of critical topics in public health law and policy — from access to care, housing and other social determinants of health, to health information data sharing and interventions to prevent opioid overdose. Recordings of many of the webinars are available on the Network’s YouTube channel. A national survey commissioned by the de Beaumont Foundation which polled 1,000 registered U.S. voters nationally found that 89 percent said they “believe that public health departments play an important role in the health of their communities.” Furthermore, 66 percent of these voters think basic public health protections should be available to all communities. This perspective was shared across political affiliation, gender, race, geography and income. This paid, 12-month multi-disciplinary fellowship focuses on developing regulatory science relating to tobacco products and FDA’s authorities under the Family Smoking Prevention and Tobacco Control Act. For mid-career professionals with a background in health communication and education, public policy, research, law, public administration, business administration, management, marketing, science, compliance or public health. Applications accepted January 3, 2019.